What was set to be a regional conference on the ecology of a New England watershed turned into a yet another spectacle of the Trump administration’s fixation on scrubbing mentions of climate change from the federal lexicon. This time, instead of rewriting web pages or deleting data, the US Environmental Protection Agency canceled its scientists’ speaking gigs. Three EPA scientists were scheduled to discuss their research on climate change at a conference in Rhode Island on Monday, called the State of the Narragansett Bay and Watershed. All three had contributed substantially to a report (pdf) released the same day on the health of the Narragansett Bay, a large, freshwater estuary affected by pollution and climate change. But at the last minute, the EPA canceled their appearances. One of the EPA scientists, ecologist Autumn Oczkowski, was scheduled to give the conference’s keynote address, and her prepared speech reportedly included information about climate change. The other two scientists—Rose Martin, a postdoctoral fellow who works at the same EPA ecology laboratory as Oczkowski and Emily Shumchenia, a contracted ecologist—were scheduled to sit on a panel titled, “The Present and Future Biological Implications of Climate Change,” according to the Washington Post. The EPA has contributed $600,000 over the last six years to the Narragansett Bay Estuary Program, which studies the health of the body of water that supports much of New England’s fishing and tourism industry. The 500-page report released Monday was peer-reviewed and lists the EPA as a funder. A significant portion of the report is dedicated to highlighting how federal and local approaches to cutting down pollution has worked, noting that the water is getting cleaner. It also devotes chapters to explaining how climate change is already changing the estuary ecosystem. 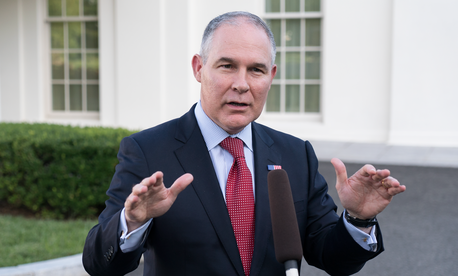 EPA administrator Scott Pruitt was a featured speaker at a conference of energy industry leaders in Houston, Texas in March. His comments to the conference, called CERAWeek, can be watched here. Local lawmakers presented at the State of the Narragansett Bay and Watershed conference in place of the EPA scientists; they held a press conference where they criticized the agency’s decision. “This type of political interference, or scientific censorship—whatever you want to call it—is ill-advised and does a real disservice to the American public and public health,” said Jack Reed, Rhode Island’s senior senator and a Democrat, at the press conference.